Knowing their planet Krypton is about to die, Jor-El (Marlon Brando) sends his infant son Kal-El (Christopher Reeve) to Earth. Upon crashing down on the planet, Kal-El is found by Jonathan and Martha Kent, who name him Clark and raise him as their own son. They also know he is not a normal child as he has superhuman powers beyond measure. Upon learning his roots, Clark takes it upon himself to use his powers to protect the city of Metropolis and the world from danger. "Superman: The Movie" is, in many ways, is the first real superhero film that took its source material seriously. Before this came out, the closest any other thing got was the campy "Batman: The Movie" starring Adam West, which is good, but let's face it, it doesn't do much to further the legacy of Batman (or does it????). Director Richard Donner shows here that you could take something thought to be for children, like a comic book, and bring it to the big screen with relatively wide appeal. 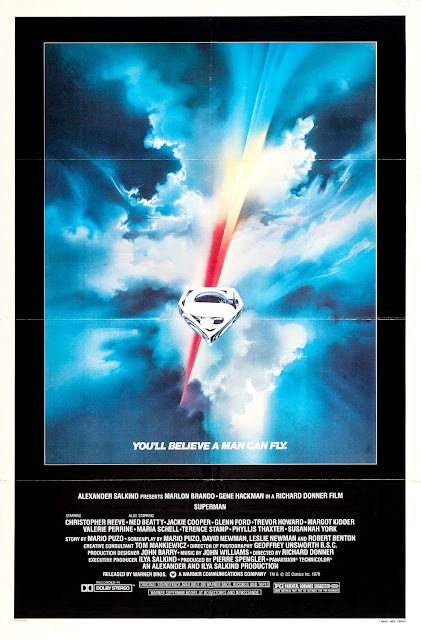 Even in an era saturated with comic book movies, the original "Superman" film stands out to us as being one of the best attempts at bringing this source material to life and treating it with respect and care. Christopher Reeve takes on the role as the man of steel himself and did it so well, Reeve himself became synonymous with the part. Even though he hadn't played Superman for nearly a decade when he was paralyzed in a horse riding accident, those who have been cast as the character since Reeve have been chasing his epic performance ever since, hoping to get one iota close to his wonderful portrayal. Reeve is quite possibly one of the best casting decisions for a character in cinematic history as he was perfect for both Superman and Clark Kent. He is convincing in his characteristics either way, even if it wasn't the most convincing disguise...parting the hair and adding glasses? Lois Lane was no slouch, but good lord, hello, captain obvious! This film also brought in big stars like Marlon Brando, who plays Superman's father Jor-El, though he didn't even bother to learn the lines for the film ahead of time and often resorted to reading them off of cards the day of shooting. Another big star at the time in this movie was Gene Hackman, who filled the role of the villainous Lex Luthor. Hackman was already an Oscar winner by this time and was unsure of taking the role, but we're sure glad he did. It all worked out well considering this went on to be the second highest grossing film of 1978, and Hackman does well in this villainous role. Playing Lois Lane, the Daily Planet reporter and apple of Clark Kent and Superman's eye, is Margot Kidder, who wholly embodies the spirit and affection of Lane. She's excellent here. This movie also stars veteran actors Ned Beatty, Jackie Cooper, Glenn Ford, and Jack O'Halloran. We really enjoy this film quite a lot. Even though it is older than either of us, it still remains our favorite incarnation of Superman. Though we appreciate what filmmakers can do with the technical advances in the more modern Superman movies, the original "Superman" is just so much more endearing. It manages to have good enough special effects for 1978 in addition to being about a captivating character. It is a fun movie with a simple yet intriguing story that developed the characters so well and truly captured the spirit of Superman. It's really no wonder some hold Christopher Reeve in such high regard. One year ago, we were watching: "Chappie"